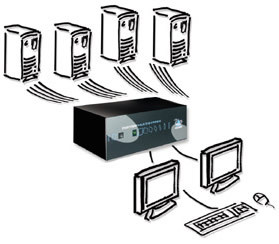 The Adder SmartView Multiscreen SVMS4-DUAL KVM Switch expands the horizons of computer control by adding multiple monitor support to an advanced KVM switch. The SVMS4-Dual enables a keyboard, mouse and 2 monitors to control 4 computers. The Multiscreen is a new concept in KVM switches and enables you to benefit from all the convenience of the proven SmartView switches which taking advantage of the multiple monitor facilities available on many modern computers. Computers fitted with multiple video cards are becoming more common as operating systems have developed to make use of the extended video "real estate" offered by multiple monitors. The increased display area enables more information to be presented to the user without reducing the resolution. The Multiscreen SVMS4-DUAL enables several computers equipped with these multiple video facilities to be controlled from a keyboard, mouse and an array of monitors. All the monitors and the keyboard and mouse are switched together from one computer to the next giving you full control of the wider picture. The Adder SVMS4-DUAL maximizes the video quality by minimizing any ghosting, smudging or fading effects. DDC (Display Data Channel) signaling is supported on all the SmartView's video ports making them "plug-and-play" compatible and enabling your computers' video cards to be configured for best performance. Control several multi-video enabled PCs from a single keyboard, mouse and bank of video monitors. High quality video with DDC support and resolutions up to 1920 by 1440 pixels. Computer selection via keyboard hotkeys, mouse, front panel key, RS232 or remote controller. SmartBoot enables simultaneous bootup of all computers. Software independent operation ensures very wide compatibility. Reliably draws power from the attached PCs avoiding the need for an extra power supply. Flash upgradeable for future device support and enhancements. Excellent for banking, security and engineering applications. Cascadeable to support more than four computers. Hardware compatible with desktop and laptop PCs, RS6000, SGI and DEC Alphas. May be linked together to synchronously switch up to sixteen monitors. Sun and USB keyboard and mouse connections plus full audio support are available to special order in addition to standard PS/2. Operation mode The keyboard, mouse and all the video heads are switched together so that the keyboard and mouse are controlling the computer whose video is currently displayed on the monitors. Upgradeability Flash upgradeable to support new devices by connecting a computer's serial port to the options port and running a download program. Hardware Hardware compatible with desktop and laptop PCs, RS6000, SGI and DEC Alphas. Standards Complies with European EMC directive 89/336/EEC. CE marked. FCC class A compliant. Answer: Thank you for the suggestion. We have added an image showing the back of this switch. You are correct, this dual monitor KVM is for PS/2. We do carry Adder KVMs with "True Emulation USB2.0 technology". Why don't you give us a call (toll free) at 1-877-586-6654, so we can help pin point the best possible solution for you needs.